How Does the Dropmaster work? How much labor time will the Dropmaster save? Why should I get a hitched mounted carrier? Can I use it anywhere? On any system? Will the Dropmaster harm the system? Can we add extra suction and discharge hoses? Can I use an extension cord with the Dropmaster? 1. How does the Dropmaster work? The Dropmaster connects to any point on the sprinkler system. Once connected and operating it maintains a constant 10”Hg vacuum, when the system is breached, as in the removal of a sprinkler head, a siphoning effect is created. This allows the fitter to replace the sprinkler head without using a bucket or creating a mess as a result of a spill. The Dropmaster’s flexible discharge hose allows for a quick and easy connection to any drain, thereby keeping the work area clean and odor free. 2. Is it easy to maintain? Yes, the system requires minimal daily maintenance that takes only a few minutes. Check the strainer daily, remove basket to clean. Remove any debris. Drain barrel daily to protect from excessive corrosion build up and freezing, if required. Check and Fill oil Reservoir as needed. Drain excess oil from the catch basin in the muffler daily. Every Dropmaster comes with a one year warranty. Made in the USA, the Dropmaster is durable, built to last, and proven in the field. The Dropmaster was designed and built for 24/7 operation if needed and all components are rated for continuous duty. 4. How much labor time will the Dropmaster save? The Dropmaster eliminates residual water in a sprinkler system so that sprinkler heads can be replaced without using buckets and tarps. By reducing both set up and clean up time many contractors report labor savings of 40% to 60%, and some even claim 80%. 5. Are replacement parts available? Most replacement parts can be purchased through Gecco, Inc. All 2010 & 2011 models parts are readily available. Most older unit replacement parts are available but some parts have limited availability. 6. Can I get a demonstration? Yes, call us or your local distributor for a demonstration. Check our “Latest News” section and our Facebook page to find where we are currently providing demonstrations and which trade shows we will be exhibiting at. There is also a series of videos under our “Products” tab that are highly informative. 7. Why should I get a hitch mounted carrier? 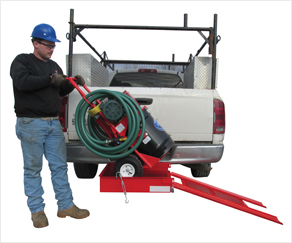 The hitch mounted carrier allows you to transport the unit in its required upright position. The hitch provides easy curbside loading and unloading. By using the hitch mounted carrier you are not taking up valuable space in your service van or truck. 8. Can I use it anywhere? On any system? Yes, the Dropmaster can be used for any type of system anywhere as long as there is a working electrical outlet or power provided by an electrical generator. 9. Will the Dropmaster harm the system? 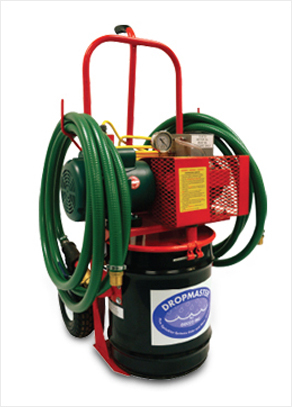 The Dropmaster is designed to maintain and not exceed 10”Hg of vacuum. Manufacturers of grooved couplings recommend not exceeding 15” Hg vacuum on a sprinkler line. The Dropmaster is the only tool that will hold the regulated margin of safety. 10. Can we add extra suction and discharge hoses? Yes, extra lengths of vacuum hose may be added. We carry this item in stock. 11. Can I use an extension cord with the Dropmaster? The Dropmaster is powered by a ¾ horsepower 15amp motor and supplied with a 20’ GFI protected 12 gauge power cord. Using an extension cord is not recommended but maybe allowable under certain circumstance.